It was a rare hot day at the farmers’ market. Shoppers wore sun dresses and hats, Happy Girl’s strawberry lemonade was selling like crazy, and the veggies called out to be scuttled directly home to the fridge. But some of us stuck around, groceries in tow, to watch four local chefs — Taylor Boetticher of Fatted Calf, Mark Sullivan of Spruce, Andrew Swallow of Mixt Greens, and Elizabeth Falkner of Orson — compete for this year’s burger master title in CUESA’s second annual Iron Chef Grill-Off. 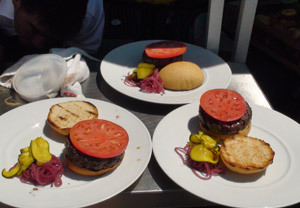 The winner, Mark Sullivan, made two types of burgers. 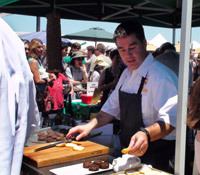 The first “appetizer-sized” burgers were made from Marin Sun Farms ground goat meat prepared with mint, garlic and harissa (and just a touch of pancetta). He wrapped the patties in fig leaves and caul fat before grilling, then topped them with Cypress Grove goat’s milk gouda and served them on a house made English muffin with fig chutney. The second, entree-sized burger was made from Marin Sun Farms ground beef and served with pickled onions and zucchini, sliced tomato, romaine lettuce, and a side or remoulade. It sounds simple, but Sullivan had a trick up his sleeve. Did we mention it was a very close race? Sullivan took the prize by a mere half point (Elizabeth Falkner was a close second). And while the crowd started off envying the four judges (who were each served four full-sized burgers over the course on an hour), most did not envy the incredibly difficult choice they had to make under pressure. 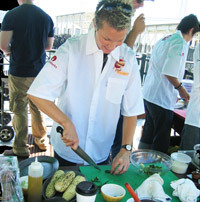 Elizabeth Falkner made the all-beef Orson burger and served it on a scallion brioche bun with foie mayonnaise, cobb relish, and house made steak sauce. Andrew Swallow’s burger was made from a mix of lamb and beef. He served it with Cambozola cheese, wild arugula and Kalamata olives. Taylor Boetticher, who says he loves grilling so much he does it several times a week when it’s warm out, made a Banh mi-style burger (based on the popular Vietnamese sandwich), with pickled vegetable toppings. Getting fired up to grill some of your own burgers this weekend? Take a look at our grilling tips and go to it!